SHANGHAI (Reuters) - Chinese cities that sit on three pollution "highways" have been told to coordinate efforts to reduce emissions, as Beijing and the country's northeast regions brace for another bout of heavy smog this week, state media reported on Monday. There are 20 cities which sit on three western, central and eastern routes on which air-borne pollutants travel north due to geological and meteorological conditions, the China Daily newspaper said citing the Ministry of Environment. 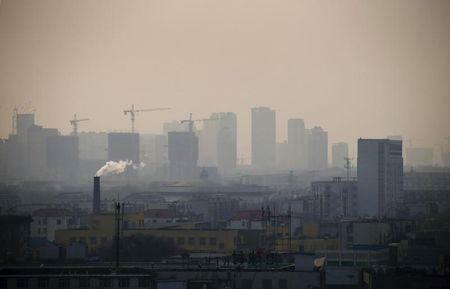 Tackling emissions in cities such as Anyang and Tangshan will reduce the severity of air pollution in neighbouring areas and help Beijing reach its ambitious target this year to reduce the daily concentration of PM2.5 harmful breathable particles to 60 micrograms per cubic metre from 73 in 2016, it said. China is in the third year of a "war on pollution", which is a sensitive topic that has spurred public protests every year about environmental degradation, particularly from factories. Xinhua reported late on Sunday that a new round of air pollution is expected to hit the Beijing-Tianjin-Hebei region this week, which will also filter to other parts of north-eastern and eastern China. The environment ministry also said that pollutants discharged from chimneys taller than 45 metres (135 feet) in cities along the routes can reach the capital within hours, and that the ministry sent inspection teams to more than 1,000 factories last year to try to tackle this issue.